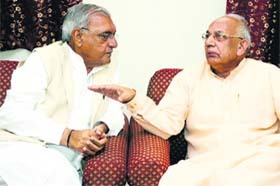 Haryana Governor-designate Kaptan Singh Solanki today said he would explore all options to resolve the stand-off over creation of a separate gurdwara panel after assuming charge tomorrow. Interacting with mediapersons at his official residence here, Solanki (75) - a Rajya Sabha MP from Madhya Pradesh - said his top priority would be to get the Haryana Sikh Gurdwara Management Committee Act examined in accordance with the law but refused to set a time-limit. 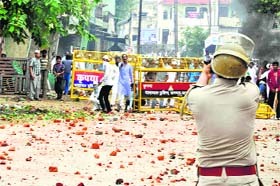 Three persons were killed and 24 others, including a policeman, injured as communal clashes broke out in Saharanpur town of Uttar Pradesh today. Members of two communities came to blows over construction of a hall on a religious place, prompting authorities to impose curfew in areas falling under six police stations. Last week, the countrywide monsoon rains were above normal by 24 per cent �the highest in the season so far. However, so far as the northwest is concerned the good news is that seasonal rains improved considerably over the past one week to bring down the deficit in the crucial agrarian region to 38 per cent. Are marks the only mark of a child? Prime Minister Narendra Modi today launched a website, MyGov, to help people contribute in governance by giving their views on important issues. Inaugurating the people-centric platform, which also marks the completion of 60 days of the new government, the Prime Minister said the success of democracy was impossible without participation of the people. 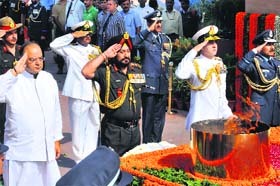 President Pranab Mukherjee today led the nation in paying homage to the martyrs on the 15th anniversary of Kargil Vijay Divas.